How and Where to Buy Alinia Online? You can place your order for Alinia with us here online at www.CanadianPharmacyWorld.com. If you’d rather speak with someone about your prescription, our pharmacy technicians would happily assist you. All you need to do is dial 1-866-485-7979. Are there Alternative Names for the Brand and Generic Alinia? Alinia is the brand name medication, and its generic Nitazoxanide is called Nizonide manufactured by Lupin in India. Currently there is no brand Alinia available. What Dosages and Forms is Alinia available in? We only carry the generic equivalent of Alinia at Canadian Pharmacy World. It is available in the 200mg, and 500 mg dosage. What is Alinia used for? Alinia is used to treat diarrhea caused by Giardia or Cryptosporidium, sometimes dubbed “traveler’s diarrhea. It can be used for people who are at least one year of age or older. Alinia is in class of drugs called anti-diarrhea medicines, which are used to treat infections caused by protozoa (single-cell parasites that live in moist locations such as the soil, lakes, or streams). What are the Possible Side Effects of Alinia? Most medications will come with side effects. Before deciding if Alinia is right for you, take a closer look at what you might expect. Are there any Precautions and Drug interactions of Alinia? You should not use Alinia if you’re allergic to nitazoxanide. Alinia may have interactions with other medications, but most symptoms are found to be mild. Be sure to talk to your doctor if you are using the above medications, and any you start or stop while on Alinia. Store Alinia at room temperature away from extreme heat and moisture, as well as light. Nitazoxanide isn’t expected to harm an unborn or nursing infant. Children younger than 12 should be given the oral suspension form. 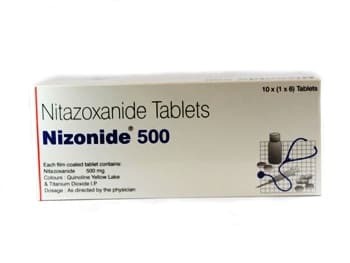 Children over 12 can be given the tablet form of nitazoxanide).